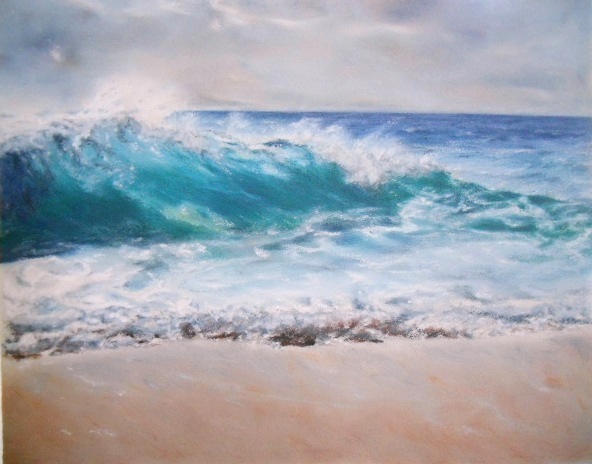 I love painting the ocean and seascapes, waves in particular – there is something magical about capturing the power of water. I’d like to say in advance to anyone affected by Hurricane Sandy that I’m sorry to bring up the ocean so soon after this recent storm, it’s just that this scene was next on my easel to be completed. A fabulous photographer, Li Newton from PMP, shot a wave scene that was one of the most remarkable I’ve seen. Oil pastels offer an array of beautiful colors for painting the ocean, although sea-foam can be a challenge with ops and I usually end up saying I’ll never paint another water scene. But in the end, tenacity wins and I find a way to show the magic of the sea – I’m always glad I didn’t give up. This entry was posted in About Oil Pastels, OPs New Paintings and tagged ocean, Oil Pastel, oil pastels, Seascape, water, wave. Bookmark the permalink. 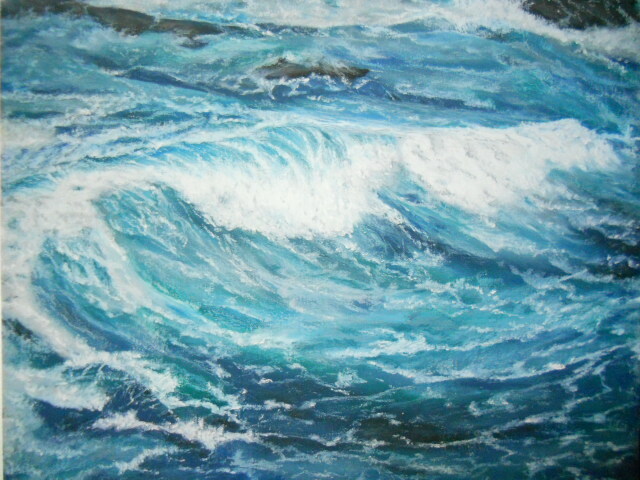 Been scrolling through your paintings and so far this is my all time favourite, but then the sea fascinates me. Excellent paintings, you’re very talented. Thank you for your generous comment and taking time to review my portfolio of works – means a lot and is much appreciated! Hi Aaron – thank you for your kind words and visiting my blog. You’re very talented and will find your way – today your cartoons rule. Enjoy! I love the water running over the beach and the different colours of the water. Hi Petronette! So nice to hear from you. Thank you for your feedback, glad you liked it! I love all your paintings, but I think this one is my favorite so far!! 🙂 You’re so insanely talented, I feel like I’m standing right there on the beach. Yes, the sea is a bit of a sensitive subject at the moment with the hurricane… I’m nevertheless a huge fan! 🙂 Well done! Strange how something so beautiful can be so devastating. I like the way the horizon on the right balances the frothy crush of wave. Thanks Cyndi, Appreciate your feedback!